The Color Picker Control provides a rich visual interface for color selection. The interaction is a familiar one from the desktop paradigm: Color range and saturation are adjusted via sliders while the technical details of the current color are displayed in RGB, hex, and/or HSV formats. The Color Picker Control can be used inline or displayed within a popup Dialog; you'll find examples of both of these implementations in the examples section. Examples: Explore examples of the Color Picker Control in action. API Documentation: View the full API documentation for the Color Picker Control. Release Notes: Detailed change log for the Color Picker Control. Download: Download the Color Picker Control as part of the full YUI Library at YUILibrary.com. With your container in place, you can now instantiate your Color Picker and pass into its constructor any special configuration values you wish to use for this instance. If you are hosting the YUI files on your server, you'll also need to add a bit of CSS for IE6 to allow the transparency in the color gradient mask to apply. The AlphaImageLoader filter's src path needs to be set relative to the page url, not the stylesheet url, as is the norm for other CSS property paths. See the Known Issues section for more detail. If your containing element (the <div> with the id of container in the above example) is wrapped in a form, all of the form field values that appear as part of the Color Picker's interface will be submitted along with any other form fields contained within the form. In the simple example above, three configuration options are shown: showhsvcontrols, showhexcontrols, and images. The second argument of the Color Picker constructor is the right place to specify all your configurations. showcontrols (boolean) Hide/show the entire set of controls. Default: true. showhexcontrols (boolean) Hide/show the hex controls. Default: true. showhexsummary (boolean) Hide/show the hex summary. Default: true. showhsvcontrols (boolean) Hide/show the HSV controls. Default: false. showrgbcontrols (boolean) Hide/show the RGB controls. Default: true. showwebsafe (boolean) Hide/show the websafe-color swatch. Default: true. Refer to the API documentation for all of the configuration options that can be set for a Color Picker instance. Note that rgbChange fires any time the user updates the color value by interacting with the Color Picker. The event may also change when a script calls the picker's setValue method; that method will fire rgbChange by default, but you can also call setValue silently and suppress the rgbChange event that would otherwise result. 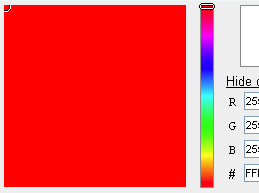 New RGB value: an array containing the new RGB value to which the Color Picker should be set. Silent flag: if true, the value will be set silently and no rgbChange event will fire. setValue is the recommended approach for setting the initial value of your Color Picker instance (that is, you should instantiate your Color Picker and then immediately call setValue to set its initial value. Color Picker uses a static, predefined set of element IDs for the DOM elements it creates on the page. You can specify new IDs to use for Color Picker by passing a new set of IDs into the constructor. //These are the default values. RGB: In the RGB format, color is described in terms of red, green and blue values, with each value described as an integer between 0 and 255. An RGB value of [0,0,0] is black; a value of [255,255,255] is white. HSV: HSV is an alternative to RGB in which color is represented in terms of hue, saturation, and value (brightness). Hexadecimal: The hex value for a color comprises a hexadecimal encoding of the color's RGB value, with each of the three colors represented by its hexadecimal value; this is also known as a "hex triplet" because it runs together the three hex values into a single string. For example, the hex value for 255 is FF; hence, the color white in hexadecimal markup is represented as FFFFFF. In the HTML and CSS standards, we generally prefix hex values with the # sign: #FFFFFF. Hex color descriptions are important because they are the most common way to identify color in HTML and CSS documents. 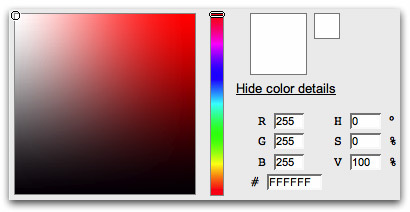 Color Picker allows you to extract RGB, HSV and hexadecimal values from any color the user has selected. Optionally, you can allow the user to have direct access to RGB, HSV, and hexadecimal values via form fields. When the user updates the form fields, the Color Picker automatically updates to reflect the new value (assuming it is a valid value). yui-picker-r Red value for RGB; 0-255.
yui-picker-g Green value for RGB; 0-255.
yui-picker-b Blue value for RGB; 0-255.
yui-picker-h Hue value in HSV space; 0-360.
yui-picker-s Saturation value in HSV space; 0-100 (%). yui-picker-v Value/brightness value in HSV space; 0-100 (%). yui-picker-hex Hexadecimal (hex triplet) value for the selected color ; 000000-FFFFFF. These form fields can be passed to the server via a traditional form post or via Ajax using Connection Manager. We've provided a detailed example of how to make use of Color Picker in a Dialog Control while implementing Connection Manager to transport the data to the server. The Color Picker comes with a default presentation or "skin," part of the "Sam Skin" visual treatment that accompanies most YUI controls. You can read more about the general approach to skinning YUI components in this in-depth article. In the case of the Color Picker Control, there is no "core" CSS treatment — which is to say that there is no CSS that is considered essential to the functioning of the control. All of the CSS provided with Color Picker is part of the Sam Skin visual treatment. To explore the CSS which controls the Color Picker's presentation, please review the Color Picker Skinning Example wherein the full CSS for the control is displayed. ColorPicker uses a transparent png mask to create the gradient effect in the Saturation/Value portion of the ColorPicker. For IE6, this mask is applied using a Microsoft proprietary filter in the included CSS.